Star Trek: The Next Generation: "Qpid"/"The Drumhead"
"Qpid"/"The Drumhead" / "Qpid"/"The Drumhead"
And yet, sitting down to write this review, I am a little irritated. Partly it's because there's not a whole lot here to unpack. Vash's subversion of Q's gameplan is intriguing, but it quickly settles back into the expected "damsel in distress" rhythms. It's cute that they end up together in the end, I suppose. Although the odds of Q getting bored and conveniently forgetting her on some planet no one's ever heard of seem fairly high. I could write about Robin Hood, but really, "Qpid" is basically just stealing some set-ups from the Errol Flynn movie (which gave us Basil Rathbone as Sir Guy of Gisbourne), and then there's a castle. The context is meaningless, and, since Q is running the show, there's no threat. In his first few appearances, Q was mercurial and potentially deadly, but now, he's just comic relief. While he made vaguely ominous comments about blood being spilt, there's no concern that anyone in the crew is going to be seriously injured. Q is no longer an unknown quantity. We understand what essentially drives him, and that he'll only go so far. Still, I suppose "Qpid" doesn't need casualties (or a potential for casualties) to be entertaining. But still, there's that irritation. It's not really anger. It's not even sharply negative. It's more frustration that a talented cast and crew were wasting their time on something that sort of just sat there for forty minutes, eating a hole in the schedule. TNG has done episodes of this quality before, and it will certainly do episodes like this again, but usually, there's some hook or odd quirk or weird runner for me to fixate on. Maybe there's something here, and I'm just not seeing it. Mostly, this episode just feels lazy, even if it isn't particularly annoying or tedious. The sudden injection of Sherwood Forest doesn't have much to do with anything, and Q's attempts to teach Picard a lesson about the dangers of romance seem half-assed, even for him. More than anything else, it feels like somebody wanted to write a holodeck episode, but then remembered we hadn't had a Q episode this season, so what the hell. The plot, such as it is: Picard is giving a speech to a bunch of archaeologists about some ruins on the planet Targus III, which nobody is allowed to ever visit. He is, unsurprisingly, stressed about giving this speech. (Troi has one of her classic "GAH SHUT UP SHUT UP SHUT UP" moments here when she essentially lectures the Captain on getting to bed.) (Note: I don't hate Troi. I just find it exceptionally easy to pretend as I though I do.) Then Vash shows up, partly to flirt, partly because she wants to find some way to sneak into those famed ruins and do a bit of grave-robbing. The expected squabbling/romantic tension ensues, and we get some weird forced drama when an exceptionally lovely Beverly Crusher shows up for morning tea at Picard's, only to find Jean-Luc already entertaining a new conquest. Or something to that effect. Anyway, Picard hasn't really told any of his friends on the Enterprise about Vash, which, seeing as how Picard rarely divulges any personal information to anyone who doesn't absolutely need it, isn't that surprising. But Vash is a little hurt that he hadn't thought to mention her. Seeing as how, so far as I can tell, they only had a weekend together, I'm not sure what her deal is, but women, right? Ha-ha, something something horribly sexist. Riker proves once again that he'll hit on anything that moves (seriously, Vash is in Ten-Forward for all of a minute before he swoops in), and Vash enjoys poking around. So, if it wasn't for the title and the cast list, it would look like this is what the episode's going to be: Picard and Vash spar, Vash vies to get exactly what she wants without entirely betraying her lover, and it all ends with what may or may not be a subtle implication of successful coitus. Except Q shows up, and he wants to do Picard a favor, or else he's bored, which basically amount to the same thing. After they have their usual conversation (it's like Dennis the Menace and Mr. Wilson, only Dennis can fold space-time in on itself, and Mr. Wilson gave up on the comb-over), Q zaps the main ensemble and Vash into a simulated Sherwood, assigning roles at random, although none of the woman apart from Vash are cast as named characters. Vash-Marian is being held captive at Sir Guy's castle; he intends to marry her or execute her on the morrow. Amusingly, Vash nearly short-circuits Q's plotting by first agreeing to marry Sir Guy and then turning Picard in when he shows up at the castle to rescue her. Of course it's all part of her own game, and Q catches her trying to get a message to Riker and the others. So it's up to the crew to rescue their captain and his lover using swords and fisticuffs and various shouts. I'm doing more plot summary here than I usually do, I realize. But honestly, that's all I got. Like I said, it's briefly unexpected when Vash throws tradition to the wind and accepts Sir Guy's proposal. This is the sort of character moment that makes me like her more than just about anything else she's done on the show; the kid-friendly femme fatale routine is amusing, but it gets old. Vash behaves logically and cleverly, and briefly, the episode rises above routine. Briefly, it becomes more than just marking time. I'll admit that the sudden transition from the Enterprise to the woods is very odd, and if I hadn't known it was coming, I may have been more delighted by it. It was nice to have some continuity with Vash, and I continue to appreciate that she's (somewhat) age-appropriate for Picard. But while it may make me a bad fan, I just don't particularly care about Jean-Luc's love life, and Vash, for all her cleverness, isn't compelling enough to make me care. I wasn't hugely bored here, and I did laugh a couple times. But while I don't expect every episode to be as intense as, say, "The Drumhead," I need some reason for a story to exist beyond, "Hey, let's dress everybody up in community theater period costumes!" Casual plotting can be fun, and a hang-out episode every now and again is good for a series like this. But this one was all about exploring a relationship that didn't matter and resolving a question no one had asked. I will say that Troi and Beverly both looked quite fetching in Merry Men outfits. Also, if this episode had just been Worf walking around dressed as Will Scarlett, it would've been much better. And once again, Worf tries to fight someone and gets injured just to prove to the crew that they're in danger. "This human emotion: love." Yes, because we've never met any other race on the show with a concept of "love" before. "He wants to do something nice for me." "I'll alert the crew." "I would've taken my own life, but for you." "We all make mistakes." "I'm in no mood for your foolishness, Q." Yes, and that is so different from the 10 million other times you've said it. It's easier to expect the worst in people because they so rarely disappoint. Most folks aren't inherently evil or cruel, but we can often be selfish and short-sighted, and if you go through life looking for these qualities in the strangers you meet, you'll find them. Partly because we're hardwired that way—biology dictates a certain level of self-interest—but also because innocence is as difficult to prove as a negative. Once you presume guilt, life will conform to your assumptions, and the longer you cling to them, the more desperately important it becomes for those assumptions to remain true. Because if you're wrong, if others are capable of dignity and nobility and honor, what does that make you? What kind of monster could look at the world and only see its shadow? "The Drumhead" is about how our prejudices and need for redemption color our ability to effectively parse information, and worse, how our expectations can blind us to the cost of our actions. It's powerful, dramatic, and moving. It's also a shade on the didactic side, at least if we're going by the dialogue-as-written. Picard gives any number of speeches about the dangers of overeager prosecution, and while the episode does a decent job in justifying the actions of its chief antagonist, it doesn't really do much in the way of making her sympathetic once the tables start turning. Once again, the Enterprise proves to be a bastion of sanity in a universe full of corrupt politicians and obsessives, and once again, if it wasn't for Picard, everyone would probably just go flat-out insane. But it works. You might be getting tired of how often I praise Patrick Stewart in these write-ups, but so much of this series wouldn't work without him as the center; it's hard to think of many other actors pulling off the heavy thematic lifting that's required of him here. (Shatner would've been entertaining, and passionate, but he would've heightened the overly-direct dialogue, rather than made it more effectively naturalistic.) Picard carries the episode, with some excellent assisting work from guest star Jean Simmons. And Worf gets to have a moral conflict, which is nice for him. "Drumhead" hits the ground running, with a cold open that takes place after an event that one would normally assume to be the focus of the episode: A saboteur aboard the ship has apparently stolen design plans and caused an explosion in the engine room. The likely suspect, a Klingon xenobiologist, has already been taken into custody, and we start with his interrogation. The Klingon, J'Dan, denies his guilt, but he doesn't try very hard, and when he mocks Worf later in private, it's pretty obvious that the bad guy has already been caught here. J'Dan takes too much pride in his contempt, and he soon admits to providing information to the Romulans. 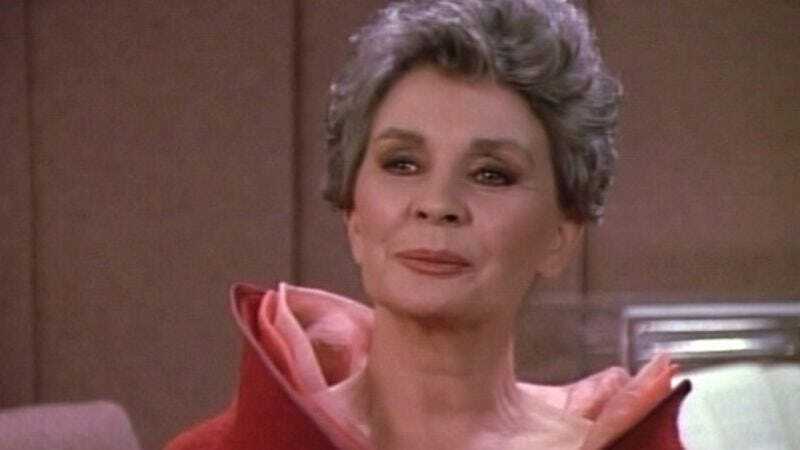 Starfleet sends Admiral Norah Satie (Simmons) to help aid Picard in his investigation of the disturbance. Satie brings with her two aides (one of them a Betazed) and an invisible chip on her shoulder roughly the size of one of your angrier continents. She's perfectly pleasant at first, of course, bonding quickly with Picard, telling him that she hadn't initially liked the idea of working with someone else, but she respects him and thinks they make a good team. There's something very brittle about her, though. Simmons plays the role very well. She brings a prim, precise presence to all her performances, and Satie is no exception. In the same scene where she tells Picard she's pleased to be working with him, the two talk about her father, and it's not hard to see what drives the admiral and how her need for justice could curdle into something more like contempt. While Satie's pursuit of the "truth" (and her persecution of anyone who stands in her way) turns into a witch hunt very quickly, she remains well-motivated. I said earlier that Satie wasn't as sympathetic as she should've been; this isn't entirely true. The final shot we see of her, alone in the courtroom after her supporters have abandoned her, is moving in all the right ways. But I do think the episode makes her shift from legitimate inquiry to pointless, self-fulfilling accusation, too easy to spot. Her victim, poor Simon Tarses, is too obviously innocent. This sort of modulation is very tricky to pull off, so the episode doesn't really lose points for being overly obvious. But as Picard says at the end, the danger of people like Satie—and, in a way, the tragedy of them—is how easy they are to follow over the cliff. "Drumhead" makes it too simple for viewers to draw the line between what's right, and what's expedient. While TNG has never been afraid of outlining its moral conflicts in primary colors, the level of performances here are so good, and the central concept so powerful, that it's hard not to wish the issues had been handled with a little more subtlety. Thankfully, what we do get is still very satisfying. Satie is determined to root out what she perceives as a conspiracy aboard the Enterprise. 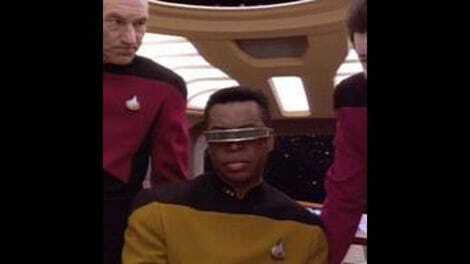 Geordi and Data eventually determine that the explosion in Engineering was caused by an equipment malfunction, but the admiral is having none of that. There's a problem here; she's sure of it, and it's her duty to root it out. She finds her first weed, the aforementioned Tarses, a crewman who works in Sick Bay and had some dealings with J'Dan. (J'Dan's spying efforts are a kind of MacGuffin, in that their only real relevance to the plot is as a motivation for others' actions. The fact that he used amino acids to transfer information, though, is unbelievably cool. It's that sort of attention to detail that makes this show such a pleasure to watch when it's firing on all cylinders, and, I suspect, adds to my frustration with genial shoulder-shrugs like "Qpid.") During Tarses' initial interrogation, he's forthcoming but nervous, and Satie's Betazed assistant senses that he's concealing something. So she decides to hound him, with no other evidence than "feelings," until his reason for nervousness becomes clear: He lied on his job application, pretending he had a Vulcan grandfather instead of a Romulan one. All sorts of fascinating stuff going on here. I may have been too quick to dismiss J'Dan's biological transmissions as mere plot ornamentation. It's the blood that's in question here, and it's the blood that both men are trying to hide. J'Dan's subterfuge essentially calls everything into question, as it conceals information under the skin, tainting whoever carries it, whether they realize it or not. Satie proves Tarses was willing to lie about his heritage to further his career. What else might he be willing to conceal about his biology? Plus, there's Satie's use of a Betazed counselor and Picard's unwillingness to use that counselor's judgment alone to determine Tarses' guilt. As Satie points out, Picard has often used Troi in the past to get a read on others in difficult situations. (In fact, Troi is present during J'Dan's interrogation at the beginning of the episode.) But there's something different about this. Satie isn't simply taking into account her assistant's interpretation of Tarses' emotional weather; she's using that interpretation to justify her own conviction that someone is guilty here and that someone needs to be blamed. I've made fun of Troi's somewhat useless presence on the Enterprise, but this scene is one of the few times that uselessness seems less a function of the writers inability to handle the character properly (which I think it generally is) and more an intentional choice on Picard's part. However reliable the Betazed intuition is, it's still just one person's word against another. Given how difficult it is to read emotions even under ideal circumstances, simply saying, "I sense he's hiding something" doesn't justify destroying a man's life. And Tarses' life is destroyed, or at least his career is; it's one of the stronger points of "The Drumhead" that it doesn't compromise on the costs of Satie's vehemence. And then, of course, there's Picard. He's a little like Henry Fonda at the start of 12 Angry Men here. While I don't doubt Riker or any of the rest of his crew (apart from Worf, who is seduced by Satie's conviction, and by his own need to prove himself) would stand behind their captain, the episode purposefully isolates Picard for much of the running time as the quiet voice of reason in an increasingly shout-based universe. Most anyone else in this role might've seemed nearly as self-righteous as Satie does, but Stewart has that whole unassuming dignity thing down cold. Even more important is the slow spread of grief across his features. It's a process that takes nearly half the episode to come to fruition, as he does his best to placate both sides, to give everyone the benefit of the doubt. Stewart plays Picard here not as a man just bothered by an injustice but horrified by it; his heroism is less boldness and more the calm decency we all should aspire to. He gets a lot of heavy chewing, monologue-wise, but by underplaying those monologues, by routinely showing Picard's shock and dismay and only letting his anger rise to the surface near the very end, Stewart heightens the sense of tragedy that pervades "Drumhead." In the end, he tells Worf that vigilance is the cost of freedom, and it's easy to see that cost etched into every line on his face. I wish Picard would've asked Satie if she were a bell, would she be ringing? Hey, that red-headed ensign Riker was eying in "Data's Day" is back! I missed her. The ending of this seems very familiar to me. (Picard pushes Satie until she snaps, and then everyone abandons her in the "courtroom.") There's a similar scene near the end of 12 Angry Men, but I think I've seen it elsewhere, as well. Maybe Inherit The Wind?